Fayette County, Illinois and surrounding areas. We specialize in real estate for Vandalia, Brownstown, Van Burensburg, St. Elmo, Altamont and the Surrounding Communities in Illinois. Our team is focused on helping you find that perfect home for your family or getting your home sold. If you are planning to buy a home in Fayette County, Illinois, whether now or in the future, give us a call so that we can discuss what you are looking to buy. We can set-up a “Property Search” based upon your criteria (square feet, number of bedrooms, acreage, etc.). We are able to get information on almost any property. 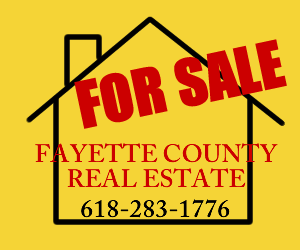 If you are planning on selling in Fayette County, Illinois, either now or in the future, give us a call so that we can look at your property and provide a market valuation. We can also offer ideas on how to maximize your profits. Look for our Yellow Signs!